GLENDALE, Calif.(Oct. 8, 2018) – Today, Disney store | shopDisney revealed its 2018 “Top 15 Holiday Toys” list. This marks the first year the retailer is sharing a list of holiday must-haves for Disney fans and gift-givers alike. The top 15 items include award-winning and exclusive toys inspired by everyone’s favorite Disney, Star Wars, Marvel and Pixar characters and stories such as the Incredible Remote-Control Vehicle fromDisney ∙ Pixar Incredibles 2, the Disney Animators’ Collection Mini Doll Gift Set and the Marvel Universe Mega Figure Set. Additionally, Disney store | shopDisney remains the only place to shop Disney Parks merchandise outside of the theme parks, including the Disney Parks Holiday Train Set and Cinderella Castle Play Set from Walt Disney World Resort. Shop in-store or online and browse the Top 15 Toys here and full Holiday Gift Guide here. Discover 13 classic characters together in one gloriously gift-boxed mini doll collection of all-time favorites, reimagined as toddlers under the guidance of authentic Disney animators and artists. This Disney ∙ PixarToy Storyaction figure does plenty of talking, and Buzz is in full protection mode with light-up details and karate chop action! Always be prepared for an enchanted tea party with this delightful Beauty and the BeastSinging Tea Cart. Lumiere sings Be Our Guest while Mrs. Potts and Chip set the scene for tea time, all the time! Load ’em up and haul ’em out! Mack has a lot to say for himself as he trucks Lightning McQueen and five more pullback action Cars to the races. Mack features lights and sounds, plus space for an additional two vehicles. Create Mickey Mouse Clubhouse memorable moments with this deluxe playset offering hours of activities. Mickey Mouse is joined by his Clubhouse friends in this colorful set that features interactive light and sound effects. Playtime will always be healthy and fresh with Minnie Mouse’s child size Farmer’s Market Stand play set. This cart full of fun produce, products, and play money makes every imaginary shopping trip a delight. Celebrate Marvel Studios’ 10thanniversary with this Mega Figurine Set. Featuring 20 of Marvel’s most iconic characters complete with detailed sculpting and metallic detailing, this epic set will save the day in super heroic style. The mechanical member of Disney ∙ Pixar’sIncrediblesis as super as the rest of the Parr family. This detailed remote-control replica of The Incredible features working headlights and light-up hood. Spider-Man has plenty of fighting words to battle his enemies as this talking action figure. And if that doesn’t work, then the friendly neighborhood super hero can use his two web slingers! All-aboard to the North Pole along with Mickey and the gang in the festive remote-control toy train gift set, including locomotive, four train cars with animated character surprises, plus over 20 feet of track. This 30-piece brunch cooking set features stylish serve ware and sweet treats – a delicious delight for mini foodies and their lucky guests! With four levels of imagination, lights and sounds, it’s a Cinderella dream come true from Walt Disney World Resort. The 10-piece set includes the five members of the Parr family from Disney PIXAR’s Incredibles2, alongside other familiar faces, so you can bring the movie to life. To continue the gift-giving spirt, Disney store | shopDisney will release a “2018 Holiday Toy Book” on October 29. 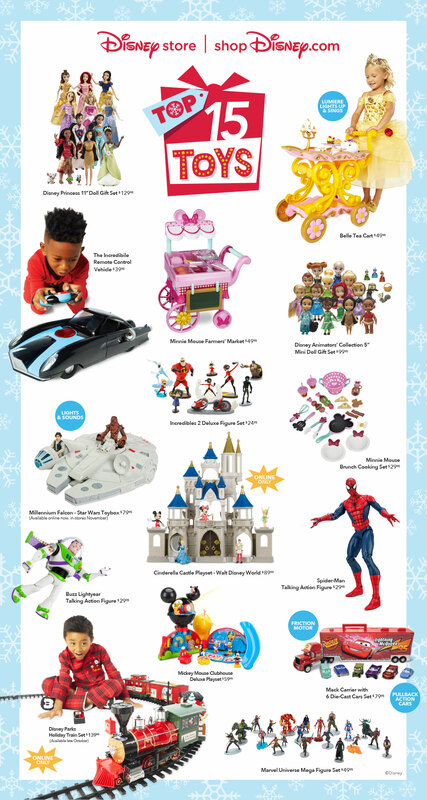 The ink-on-paper holiday catalog will include Disney, Pixar, Marvel and Star Wars toys, gifts, décor and more for kids and families available at Disney stores | shopDisney. As families dig in and start to build their holiday wish lists, they will discover special Disney surprises throughout the catalog including 40 hidden Mickeys and fun stickers to mark their favorites. Pick up a copy at any Disney store starting October 29. On Saturday, November 3, Guests can join the “There’s Magic in Store Holiday Event” for Disney store’s big reveal of special holiday décor and a kick off to get everyone in the Holiday spirit. From store opening, Guests can wear their holiday best, take a holiday photo and participate in story time and hear from the new holiday book Holiday Mischief with Stitch. For more information visit shopDisney.com/storelocator. Disney store and shopDisney continue to have the broadest selection of toys, collectibles and uniquely designed giftsacross Disney, Pixar, Star Wars and Marvel for fans of all ages across fashion, accessories, toys, tech, home and more. Since its launch in 2017, shopDisney is home to more than 80 brands including exclusive and hard-to-find items, wish-worthy toys, designer collaborations and an expanded assortment of Disney Parks merchandise. Disney store | shopDisney Top 15 Holiday Toys here.